If there were an award for the best father in the bird world, it would undoubtedly go to the African Jacana or “lily-trotter” (Actophilornis flavirostris) as this waterbird is often called. 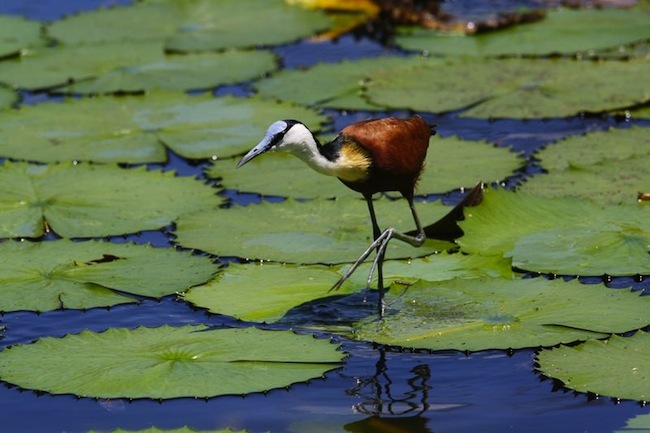 African Jacanas are equipped with long, gangly legs and clawed toes, making it possible for them to walk over floating hydrophytes – usually water lilies – with impressive agility. To attract a female, a male must lure her in by constructing a floating nest. This simple platform of sticks and plants is positioned on floating aquatic vegetation. Female African Jacanas (which are larger than their mates) defend territories, which include multiple males in adjacent areas. Females lily-hop from male to male, laying about four eggs, marbled with light brown and black for camouflage. She then moves on, leaving the male to do all the dirty work. He sits on the eggs and, after they hatch, dedicates himself to rearing the chicks. This stay-at-home dad even carries his young ones under his wings to keep them safe and warm until they are about two or three weeks old. The fledglings remain with him for a period of about 40 – 70 days. African Jacanas are an absolute delight to watch! They forage along the fringes of wetlands, seasonal pans, and slowly meandering rivers, feeding on insects, larvae, worms, crustaceans, molluscs, and sometimes seeds. The African Jacana is one of two jacanas found in Africa, the other being the smaller, shyer Lesser Jacana. Competition between the two species is reduced due to the size difference (the Lesser Jacana can walk on grass and floating vegetation that it too light for the African Jacana). 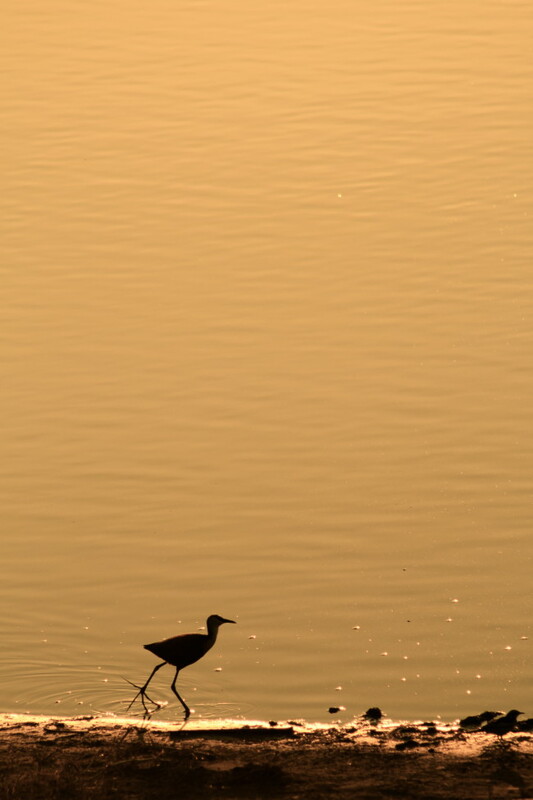 So where’s the best place to see an African Jacana? African Jacanas are common waterbirds. According to BirdLife International their population is estimated to number 1,000,000 individuals. They are endemic to Sub-Saharan Africa, with a wide range that extends from Senegal to Ethiopia and southwards through the savannah belt into Southern Africa. 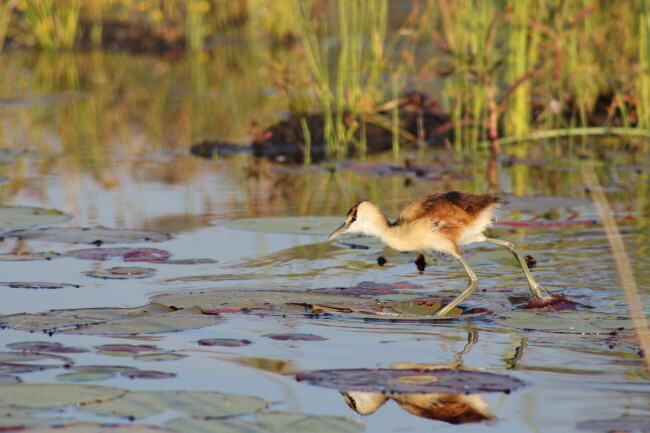 The largest concentration of African Jacanas in Southern Africa are in Botswana’s Okavango Delta; however, you are bound to see these delightful birds on many of our water-based trips to Zambia, Zimbabwe, Malawi, Tanzania, Kenya, and South Africa.